I’ve got a super quick post for you today. 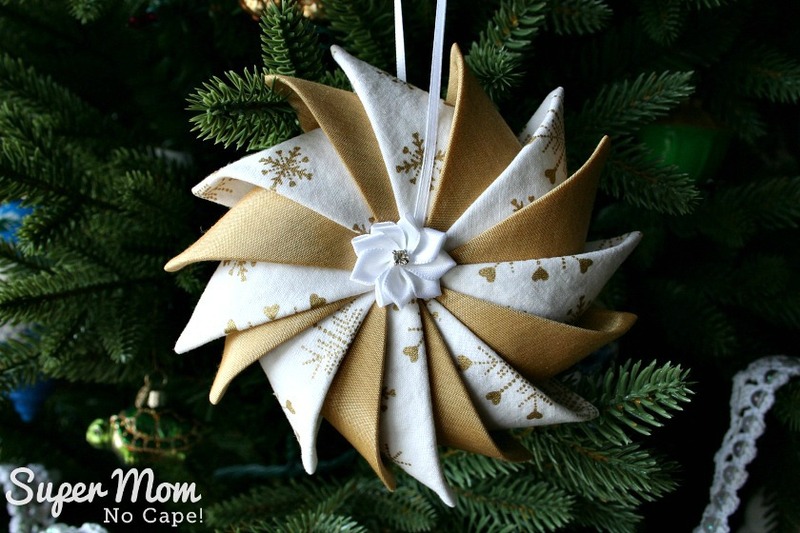 My Prairie Point Star Ornament Tutorial is the most popular of all the tutorials I’ve posted. 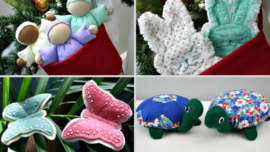 Over the years, I have occasionally received emails from readers asking if I can suggest an alternative to the button centers as their hands were no longer strong enough to pull the needle through the finished ornament to snug the buttons in place even with the help of the surgical clamp or pliers to grip the needle. 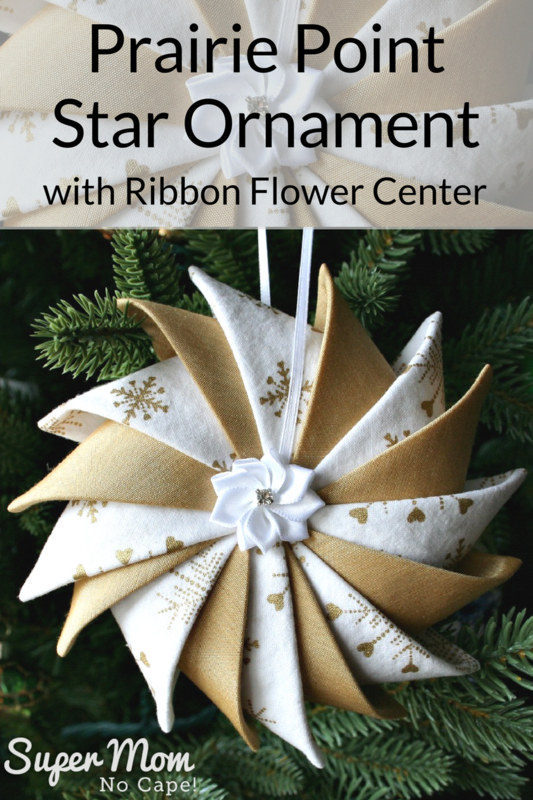 A while ago, I came across a beautiful Prairie Point Star Ornament that someone had posted on Facebook that used three tiny ribbon roses in the center in place of the buttons. I’ve been intending to make one ever since. I finally finished this one to share with you a few hours before we left on vacation and had just enough time to snap some photos of it. Once we get back, I’ll do a proper tutorial but I’m sure that most everyone will be able to figure out how to add these on their own. 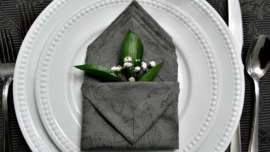 For this ornament, I used eight 4.5″ squares of a white cotton with gold snowflakes and eight 4.5″ squares of a gold satiny fabric. As you can see rather than three tiny ribbon roses, I used a single ribbon flower. Joann’s was completely out of white ribbon roses the day I was shopping for them but they did have a small package of four satin ribbon flowers with rhinestone centers. I’m actually glad now that Joann’s was out of the ribbon roses because I really like the way this one turned out. 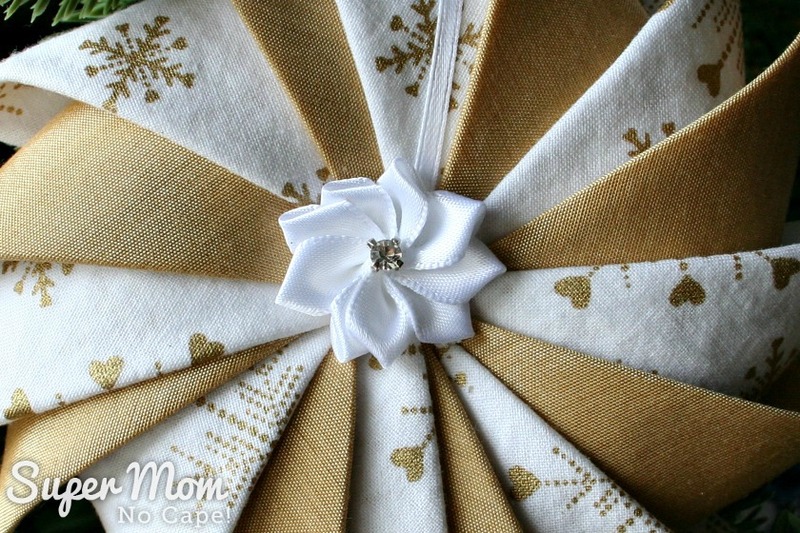 If you can’t find any at your local fabric store, you can order a package with several different colors of Satin Ribbon Flowers w/ Rhinestone Appliques . I’m not usually one to do themed Christmas trees as we have so many ornaments that we’ve collected over the years that I like to bring out. 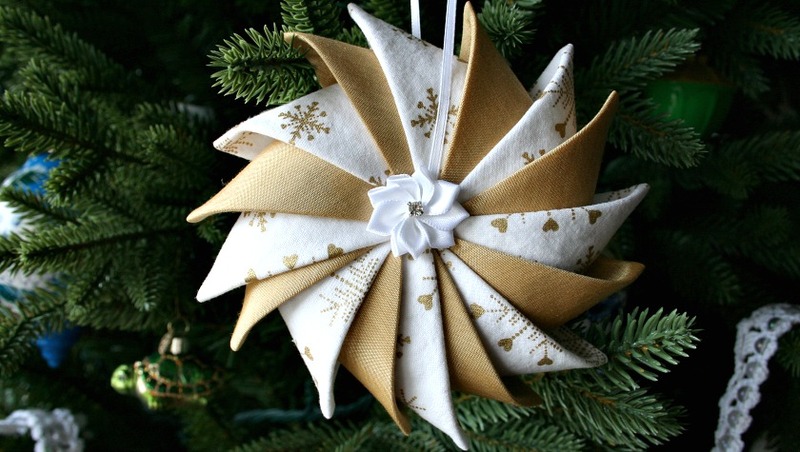 But next year, I might just need to put up a second tree as I have this picture in my mind of an entire tree of handmade White and Gold Prairie Point Star ornaments with these Ribbon Flower Centers mixed in with white and gold versions of my Sawtooth Star Ornaments with Applique Centers. 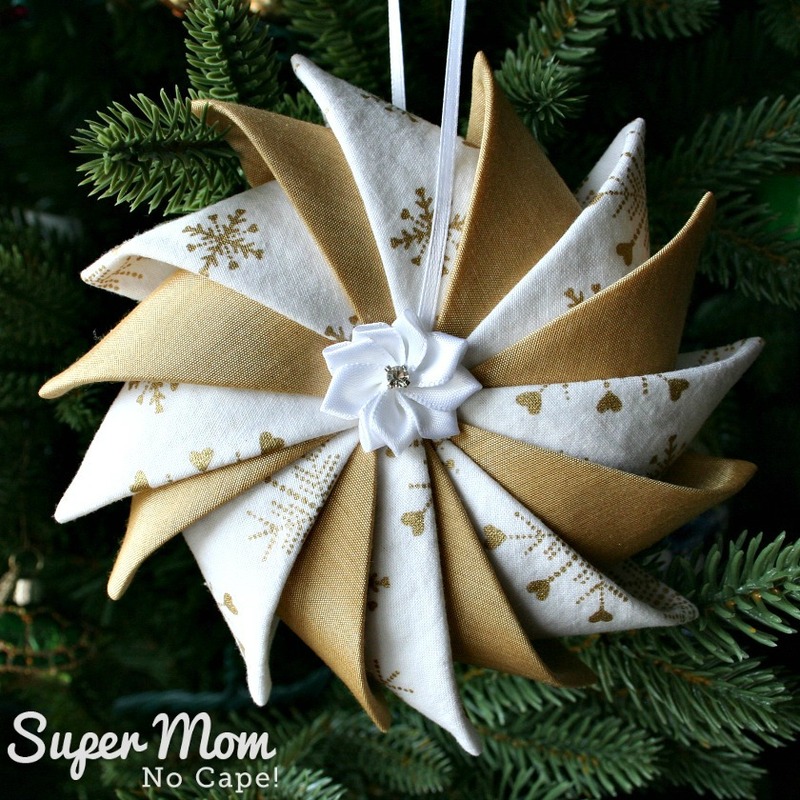 Whether you’ve felt unable to make a Prairie Point Star Ornament because you weren’t sure you could add the button center or if you just like the way this new version looks… I hope you’ll be inspired to try making one or more Prairie Point Star Ornaments to add to your holiday decorations! Pin this for future reference by clicking on the Pinterest button underneath this post. And of course, I’d love it if you shared it on Facebook or Twitter. I love the new idea, thank you so much. Enjoy your trip, Merry Christmas and a most Happy, Healthy New Year. This is just beautiful…I’m one of those who might have trouble with the hand strength issue, but I’ve got this on my list to try!! Lovely! This has been on my list to make since you first posted it – and I STILL haven’t gotten around to it. Maybe next year? Thanks for the reminder. 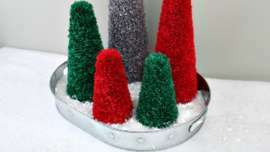 It’s a lovely ornament – maybe you could make a garland of them instead of having to find another tree? The Prairie Point with the jeweled flower is awesome. I really like the idea. Hello Liss… yes, they should look the same on the front and back. The prairie points are folded over the lightly stuffed circle with one corner sewn to the front and one corner sewn to the back. And thank you for your sweet compliment!